Greetings to all you e-lesson readers out there. I welcome you, once again, to another installment of FGM’s free lesson portion of our monthly newsletter. Each month, when you click here, you will find something new to add to your guitar technique and overall flatpicking guitar knowledge. I try to mix things up from time to time in order to continue offering a little something for everyone. This month, instead of arranging two versions of the same tune, I chose to give you two different classic melodies. I paired these great tunes together because “Turkey In the Straw” and “Arkansas Traveler” are both flatpicking standards that have made their way into mainstream pop- culture. 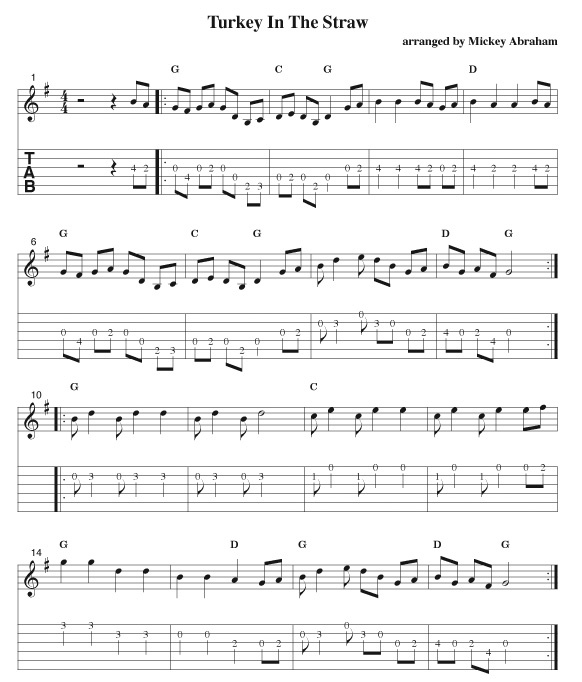 Many folks will recognize the first couple measures of these melodies, but unless they are a bluegrass or folk musicians, they might not know the names of these tunes. My first exposure to “Turkey in the Straw” was as a kid, hearing the ice cream truck coming down the road in my neighborhood. I must say that Aubrey Haney’s Texas swing version is more musical to me now, but nonetheless, the sounds coming from the ice cream truck implanted that melody in my head. To many, the “Turkey in the Straw” melody will get folks singing the famous children’s lyrics, “Do your ears hang low? Do they wobble to and fro?” I am not sure where those lyrics are from originally. As for “Arkansas Traveler,” I feel I first heard this tune in a Bugs Bunny cartoon. It was a slow and bouncy version done in a very low octave. I even remember some kind of lyrics that included the word “bumblebee.” Am I getting off track? 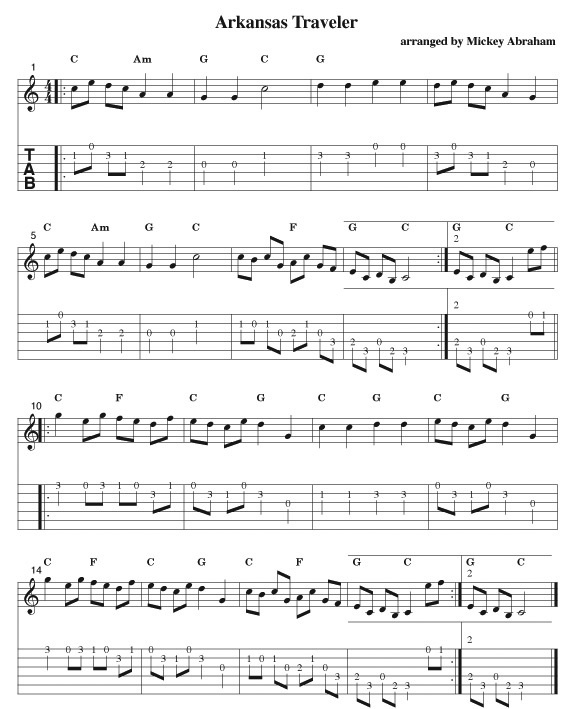 The point is that these melodies are so great that they have been used and enjoyed by many musicians over the years.